I was sipping coffee and reading the newspaper at my breakfast table before work only to be surprised by the soft, familiar click-clack of vulture talons coming down the hallway. A a fuzzy baby vulture face peered around the corner at me. It was Huxley, the yellow headed vulture chick, who was out of his pen in my office and had come to seek out the action in the living room. 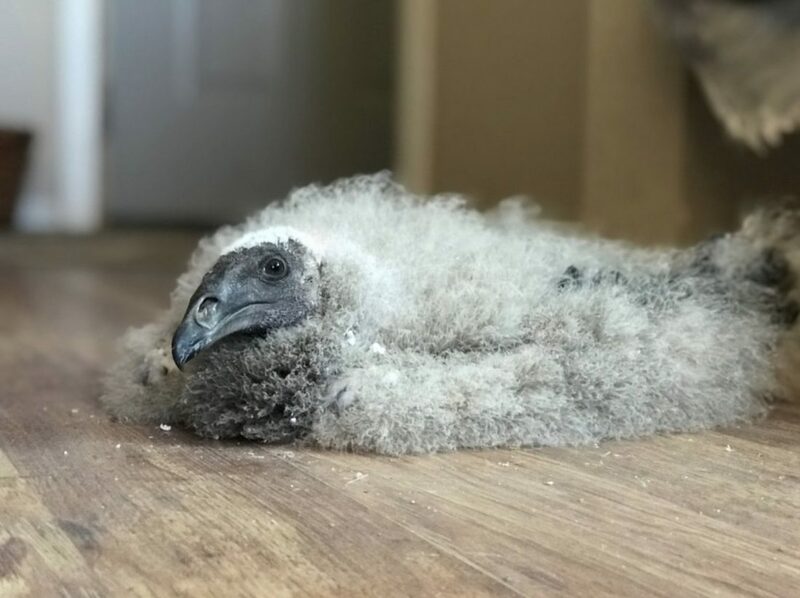 You might ask what raising a vulture in the house has to do with preparing an animal for a life of education work, and that is a perfectly valid question. 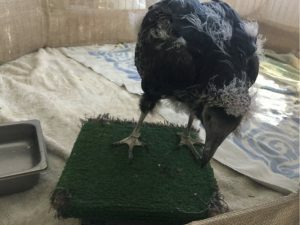 Vultures, like most of our birds, are not the best suited for home life, with their huge wings, beaks that like to pull things apart, and need to be outside for sunlight. 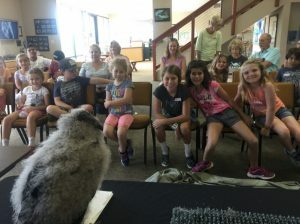 However, as youngsters, there are a host of benefits to raising youngsters under constant supervision, whether it’s in my office or in our education room, that provide an excellent start to life as an ambassador to the species and conservation efforts for birds and other animals all around the world. Raising and training an education animal well to promote conservation endeavors, just like raising well-adjusted kids, takes resources, preparation, science, and skill. 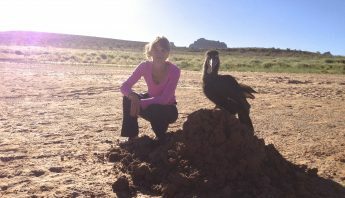 The qualities that an animal needs to in order to be successful as an education ambassador – comfort in crowds, calm in noise, movement, among a variety of unpredictable stimuli in order to respond to cues from a variety of animal trainers – are different than those qualities needed for exhibit and breeding animals. Each plays a vital role for wildlife conservation and education, but the demands on an education animal’s response to a cue are critically important for the animal’s safety as well as the message that it sends out. If the animal uncomfortable around a crowd, it might not portray the best message to its audience. When we have a true showoff, we see it. An animal can absolutely find an audience reinforcing to be in front of. Just ask a cockatoo…The more attention, the better! Our first focus in early rearing and socialization is to normalize strange and varied stimuli to the young bird as much as we can. This means hanging out in a controlled chaos, listening to music, noises, taking the animal outside, adjusting to the constant stream of household visitors and ABI ranch guests, going on car rides to our outreach events, going on car rides for no reason, wearing hats, using umbrellas, crazy patterned clothing, exposing the bird to bouncing balls, strollers, other children’s toys, and essentially offering up anything we can think of while the young bird is in this early spongey stage that he might encounter in his career as a teacher of conservation. 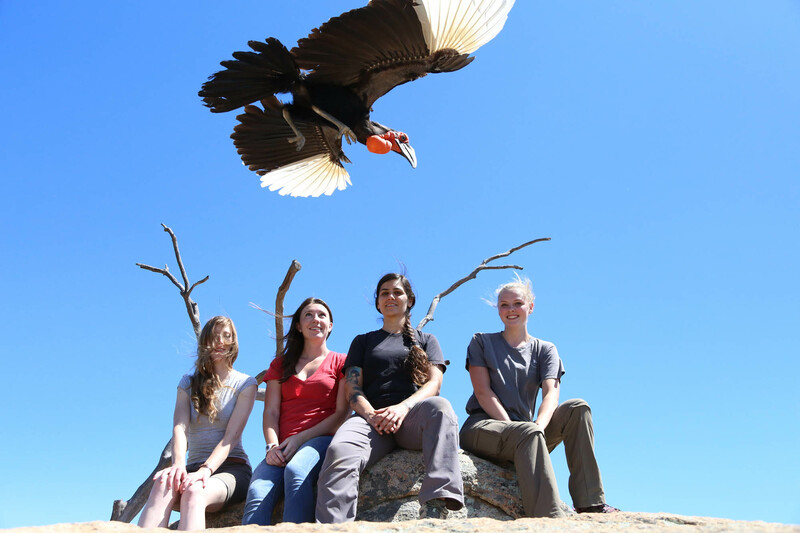 Huxley, our yellow headed vulture, went on numerous education programs as a fuzzy chick with us, spreading the word about vultures and their enormous impact on the environment. First, bringing a cute baby bird, no matter what species, is always fun and engaging. This makes a big impact on our audience, who most likely has never been so close to a vulture before, let alone a vulture chick. The more programs Huxley went to, the more confident and comfortable he became around large groups of people. The other part of Huxley’s early rearing and socialization process is the establishment of positive reinforcement practices that will be the foundation of his lifelong behavioral repertoire. Huxley, like all of the birds we raise, is worked with a positive reinforcement foundation in every interaction we have with him. Think of it as a mindset, a paradigm that lays well entrenched patterns of action. Just like parents that teach their young children to say “please” and “thank you” for each request so that the early establishment of manners becomes part of part of a young person’s life, Huxley learns early on that he gets something that is valuable for everything that we ask. When he rides around on the glove or in a carrying crate, he typically is going somewhere that he wants to go. When he is asked to step on to a scale, glove, or into a crate, he gets something he wants, like a bit of food, or even in some cases, a gentle face rub. If Hux does something that we don’t want, such as use his beak to nibble on our arms, we remove our arm and offer him something that is more appropriate for him to chew on. Being in close proximity to people all of the time while he is growing up, we constantly have the opportunity to work offer him a training session; in fact, every time we see him, we are influencing his behavior. We are, in effect, setting ourselves up for success by making the right behavior – offering regular training sessions throughout the day – easier for us because the young bird is close by. When we are raising young birds for a free flight program for a zoological garden, one of the most important birds to get a good foundation of early training are parrots. Our training paradigm with the macaws is to start when they are still nestlings, using their formula to teach them how to step up, step from hand to hand, sit and stay on the perch while the door opens, and eventually to fly to the hand all while they are still “in diapers,” so to speak. They also get lots of toys to learn from an early age how to occupy themselves and engage in enrichment activities. This is a critical early development skill that will serve an intelligent species like a parrot well for them throughout their lives. They have well established play skills to help them stay busy during non-working times. They understand how to sit on a perch instead of cling to the aviary bars every time someone walks into their enclosure from their earliest perching days. 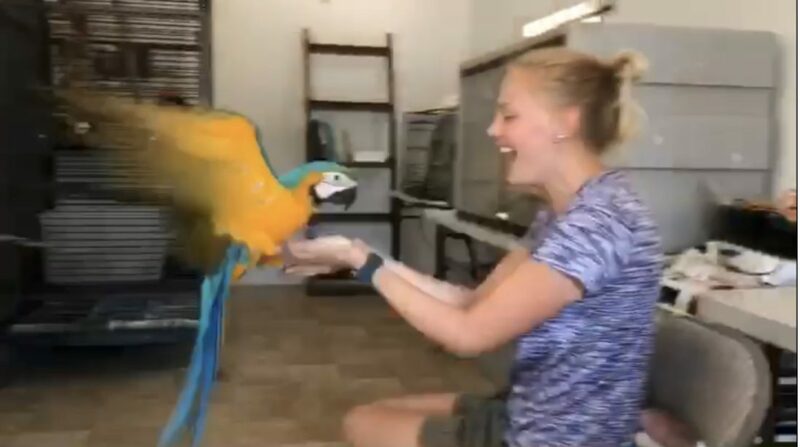 We don’t necessarily believe that a training a parrot for free flight relies on this parental bond of using the hand-feeding formula and the pre-weaning stage of development is critical for free flight success. 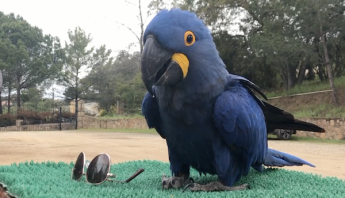 Rather, we use the parrot baby’s entire life, from nestling stage to adulthood to establish a behavioral repertoire based on positive reinforcement. While this may set us apart from some industry norms, we do hope that our success coupled with the small amount of added effort it takes in the short run will inspire others to reap the rewards in results, streamlined process, and safer experience it makes for the birds. Not only does the outcome speak for itself, but the mindset in both human and animal produce one of a solution-seeking, prevention-oriented paradigm, that training and behavior management is a way of thinking, not just a tool to access when problems crop up. 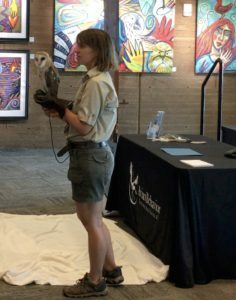 You might notice that our focus is raising conservation ambassadors that are captive bred, instead of those that are formerly wild and rehabilitated after an injury, illness, or early human imprinting. 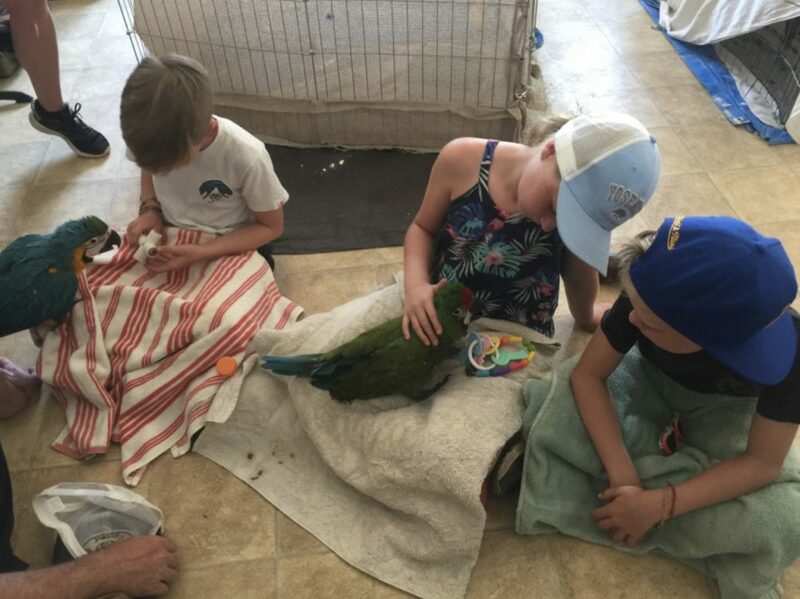 While some rehabilitated animals may make good education ambassadors, because our focus is on freely flighted birds, we focus our efforts on early socialization and early training with an animal that is carefully selected for the job of education. Wild animals learned to develop a fear of humans from an early age. The rehabilitation process can further ingrain those fears, as anyone with a companion dog or cat that dreads going to the veterinary office can agree. Overcoming the physiological response to stress even just in basic handling, let alone presenting in front of crowds can take an extraordinary long time. For us here at Avian Behavior International, bringing up conservation ambassadors is hugely rewarding. Sharing baby birds, whether it’s a fluffy baby owl or a honking young macaw, is always heartwarming. 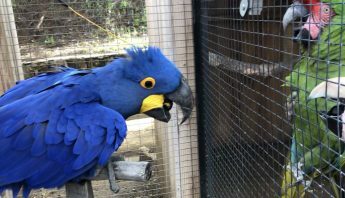 Teaching ranch guests about the general mechanics of creating a supportive environment, whether this means giving those macaw beaks something appropriate to chew on instead of our fingers or making sure the vulture likes riding around in his travel crate, helps draw parallels to keeping companion dogs and cats happy or even relating to one another as humans. We take on the role of responsible presentation of wildlife conservation messaging very seriously and strive to make sure with every step we take, our animals are happy to do their jobs, as well. It’s a fulfilling job both in the reward of a happy animal, a happy audience, and when we make a difference in the lives of wildlife and natural resources around us.